You say "solar battery, "I say, "solar cell." The nomenclature has evidently changed since the time when commercializable solar cells first came on the scene. Conversion efficiency rates of 6% are heralded, enough they say so that "...a wafer-thin slab of crystal, 4 ft. x 15 ft., either resting on or built into the roof of a house, could supply enough current to operate all the lights, stove, refrigerator, and other appliances in the house - 24 hours a day." Even with today's efficiencies in the 20% realm, you couldn't power much of a house on a 4 x 15 ft. array. Maybe they meant if you had a gas lights, and a gas powered refrigerators( yes, they exist) and a gas stove! The universe's greatest source of potential power - even greater than the atom - has been harnessed experimentally and offers great promise for future commercial applications. 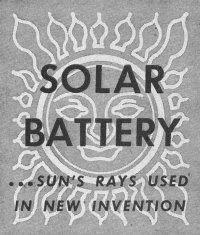 A solar battery, the first successful device to convert useful amounts of the sun's energy directly and efficiently into electricity, has been demonstrated by the Bell Telephone Laboratories. 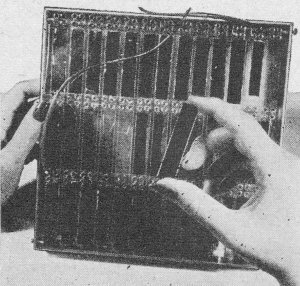 With an amazingly simple - looking apparatus made of strips of silicon, the scientists demonstrated how the sun's rays could be used to power the transmission of voices over telephone wires. These strips are extremely sensitive to light. Linked together electrically, they can deliver power at a rate of 50 watts per square yard. G. L. Pearson. 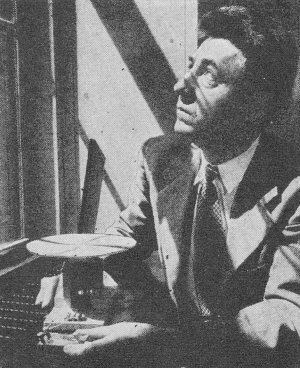 D. M. Chapin. 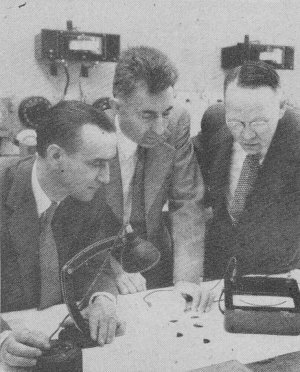 and C. S. Fuller of Bell Labs checking sample devices for amount of electricity derived from "sunlight" (lamps). The solar battery, composed of strips of specially prepared silicon. has been used to power transmission of voices over telephone wires. 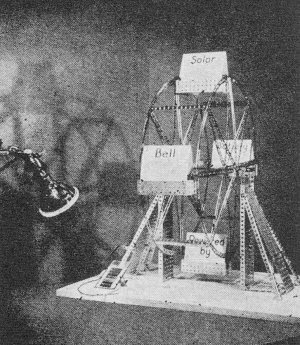 A toy Ferris wheel which receives its power from light falling on a tiny piece of silicon. It was used to demonstrate principle. According to the Laboratories, it is possible to achieve 6 percent efficiency in converting sunlight directly into electricity. This compares favorably with the efficiency of steam and gasoline engines in contrast with other photoelectric devices which have never been rated higher than about 1 percent. 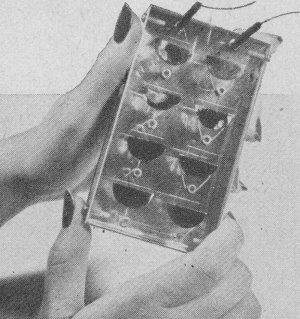 With improved techniques, the Bell Laboratories' scientists expect to be able to increase this efficiency substantially. Nothing is consumed or destroyed in the energy conversion process and there are no moving parts so, theoretically, the solar battery should last indefinitely. The specially prepared silicon used is obtained, originally, from common sand, one of the world's most abundant materials. Silicon is a semiconductor, chemically related to germanium, the material used in most transistors. Silicon has a much greater electronic stability at higher temperatures than other semiconductors. Although work is still in the laboratory stage, actual use of the solar battery in telephone work is a strong possibility. For example, silicon solar batteries might be used as power supplies for low-power mobile equipment or as sun-powered battery chargers which could be used at amplifier stations along a rural telephone system such as that now being tested at Americus, Georgia. This system, using transistors, points to greatly increased service on rural telephone lines without the addition of new wires. Although the sun supplies over a thousand trillion (1,000,000,000,000,000) kilowatt hours of energy daily-comparable with all the reserves of coal, oil, natural gas, and uranium found on earth-man has never been able to convert more than a small fraction of this energy directly to his use. Another successful attempt at converting light into electrical energy has been reported by the Wright Air Development Center in Ohio. 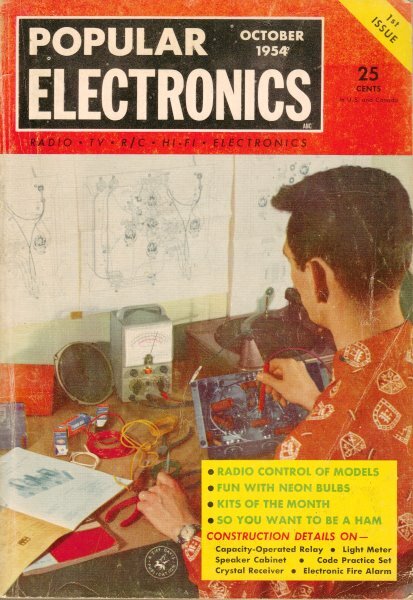 Their method differs from that of the Bell Labs development in that cadmium sulfide was used in place of silicon. Donald C. Reynolds and Lt. Col. Gerard M. Leies discovered the excellent properties of this substance while collecting data for rectifiers. The barrier layer cell, as developed by the WADC scientists, consists of cadmium sulfide processed into crystal form. The crystal used in the first model was about the size of a sugar cube but it need be only wafer thin to work efficiently. Although the first model was crude, the inventors foresee that with several improvements and by hooking a number of the units into relays it is possible to step up the voltage to unlimited quantities. According to their report, the conversion powers are so great that a wafer-thin slab of crystal, 4 ft. x 15 ft., either resting on or built into the roof of a house, could supply enough current to operate all the lights, stove, refrigerator, and other appliances in the house - 24 hours a day. of the Bell solar battery.